National Freedom Front (NFF) spokesman Mohammed Muzammil said today the government was attempting to betray the security forces and mislead the people by saying the Bill on the International Convention for the Protection of All Persons from Enforced Disappearances (ICPAPED) would not applicable to the past. He told a news conference that even though it was true that laws passed in parliament were not applicable to the past, that did not apply to internationals laws and conventions, according to Article 13(6) of the Constitution. “In the case against Sepala Ekanayake who hijacked a plane, Supreme Court ruled that the Offenses Against aircraft Act No. 24 of 1982 could be applicable to the past as it had been enacted based on three International Conventions though Mr. Ekanayake’s attorney, Colvin R. de Silva argued that he could not be prosecuted because hijacking of planes was not a criminal offence in Sri Lanka at the time incident occurred. So it is clear that our Constitution has provisions to allow laws based on International Conventions to be applicable to the past,” Mr. Muzammil said. He said under this Convention, anyone involved in incidents that took place after 1992 could be prosecuted because this convention was signed in 1992 and added that anyone connected to incidents in 1989 could not be prosecuted. Mr. Muzammil said only 57 countries out of 193 had signed this Convention and added that the enactment of this Bill in Sri Lanka would leave room for the security forces to get trapped in the international net. Obviously somebody is lying due to the fear of elections. OMG,where was this guy?please don't trust his comments. If one has not committed any crimes in the past, present or future, there is nothing to worry. If someone has committed a crime in the past, he needs to be punished. This is a universal law not just to plant earth. Justice must prevail! your universal law becomes horse manure when prosecuted on trumped up charges with manufactured evidence. He should not respect domestic law as he had hidden/used more than 90 M worth gov vehicle and does not know about any international conventions. Just imagine, a rotten egg who has only grade 8 qualifications owning a car worth 90 million. Oh my God... what a curse. So this guy is back to crow for WW. What a shame this shows you people have no place to go when kicked out and still hang around this moron. Half boiled dead chicken (Muzamil) had come again. Ha..Ha..Ha.. Probably this dead vegetable Muzamil needs one more jail term until lifetime. 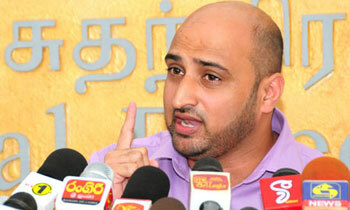 This crook was missing for a long period, now again barking like his boss Weerawansa. Muzamil even if you and Wimal stand up-side-down, you both are counted "Robbers", no change. Muzamil what happened to your Hora Passport Wimal? Hope he will have to face the judicial again and serve his jail terms for his other crimes too. Why are there so many politicians in this country who support murderers? it is very funny, a pavement rotter talking about International Laws, he is and boss are No. 1 noted criminals who looted our money in billions. Muzamil, I know you pretty well from you teenage, those days itself you get in to others garden and rob mangoes and coconuts. Correct???? If Ranil offers you a job as a Gardener at temple trees, will you take up that job? the so called sinhala buddhist nation.. 70% ( /-) sinhala buddhists.. but dead scared to face the truth.